Org-wide teams provide an automatic way for everyone in a small to medium-sized organization to be a part of a single team for collaboration. With org-wide teams, global administrators can easily create a public team that pulls in every user in the organization and keeps the membership up to date with Active Directory as users join and leave the organization. Only global admins can create org-wide teams and currently an org-wide team is limited to organizations with no more than 5,000 users. If these requirements are met, global admins will see Org-wide as an option when they select Build a team from scratch when creating a team. When an org-wide team is created, all global admins are added as team owners and all active users are added as team members. Users who are disabled for Teams, guest users, and most rooms aren't added to the team. As your organization's directory is updated to include new active users or if users no longer work at your company and their Teams license is disabled, changes are automatically synced and the users are added or removed from the team. Team members can't leave an org-wide team. As a team owner, you can manually add or remove users if needed. If you don't see the Org-wide option when creating a team and you're a global admin, the feature might still be rolling out or your organization might have more than the current size limit of 5,000 members. We're looking to increase this limit in future. Rooms that aren't a part of a room list, equipment, and resource accounts might be added or synced to the org-wide team. Team owners can easily remove these accounts from the team. To get the most out of your org-wide team, we recommend team owners do the following. Reduce channel noise by having only team owners post to the General channel. Go to the team and click More options (…) > Manage Team. On the Settings tab, click Member permissions > select Only owners can post messages. Reduce @mentions to keep them from overloading the entire organization. Go to the team and click More options (…) > Manage Team. On the Settings tab, click **@mentions** > turn off Show members the option to @team or @[team name]. Favorite important channels to ensure everyone in your organization engages in specific conversations. To learn more, see Auto-favorite channels for the whole team. Even though members can’t leave an org-wide team, as a team owner, you can manage the team roster by removing accounts that don’t belong. Make sure you use Teams to remove users from your org-wide team. If you use another way to remove a user, such as the Microsoft 365 admin center or from a group in Outlook, the user might be added back to the org-wide team. Is there a way to create an org-wide team other than using the Teams client? Global admins can only create an org-wide team by using the Teams client. If your organization limits creating teams to using PowerShell, the recommended workaround is to add your global admins to the security group of users who can create a team. For more information, see Manage who can create Office 365 Groups. If this isn't an option, you can create a public team using PowerShell and add a global admin as the team owner. 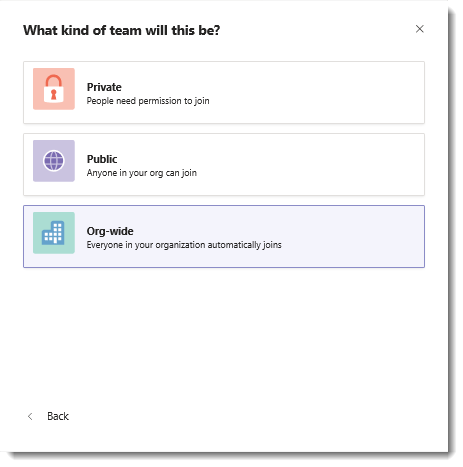 Then, have the global admin click ˙˙˙ More options next to the team name, click Edit team, and then change the privacy to Org-wide - Everyone in your organization will be automatically added. Note that only team owners can access the Edit team option and only global admins can see the Org-wide option. Is there a way to convert an existing team to an org-wide team? Global admins can convert an existing team to an org-wide team editing it in Teams client. Go to the team name and click More options ...(ellipsis) > Edit team.